Unit 1 at the Virgil C. Summer (V.C. Summer) Nuclear Station will be brought offline on Friday in order to complete regular refueling and maintenance operations. South Carolina Electric and Gas Co. (SCE&G), the owning company, states that this is a regular procedure that occurs every 18 months. 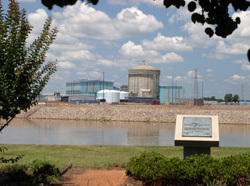 “The plant has run very well during the last 18 months, and this outage will allow us to perform testing and maintenance to assure another 18 months of safe and reliable operation,” SCE&G Vice President of Nuclear Operations Dan Gatlin said. During this outage, approximately a third of fuel assemblies will be replaced, and preventative maintenance will also be performed. Maintenance is typically done during these refueling periods because it would be impossible or unsafe to perform them while the unit is in full operation. The company states that other generating plants will be making up the generational capacity to the state while this unit is undergoing an outage. The V.C. Summer facility houses one operational nuclear reactor and has two units, with an expected 1,117 megawatt capacity each, currently under construction. SCE&G is a public utility that generates and distributes electricity to 24 counties in South Carolina and serves approximately 695,000 customers in the state. Want to get notified whenever we write about South Carolina Electric and Gas Company ? Next time we write about South Carolina Electric and Gas Company, we'll email you a link to the story. You may edit your settings or unsubscribe at any time.